In Syria—where France backed the NATO war to topple the Russian-backed regime since the war began in 2011, even recognising US-backed opposition militias as Syria’s government—Macron floated the possibility of reopening France’s embassy in Damascus. He also proposed developing closer counter-terrorism cooperation with Russia. Macron stood by silently while Putin denounced economic sanctions Washington forced the EU to impose on Russia. To address the conflict that erupted inside Ukraine after Washington and Berlin backed a fascist-led putsch against a pro-Russian government in Kiev in 2014, Macron also endorsed the “Normandy format” of four-way talks between Germany, Russia, France, and Ukraine. This negotiating format pointedly leaves out the United States. Significantly, sections of the international media are beginning to discuss the vast implications of this policy shift, coming as Germany, Macron’s main ally, remilitarises its foreign policy. Coming after Trump’s foreign tour to the Middle East and Europe, during which Trump laid out an aggressive pro-Saudi and anti-Iranian line, the magazine pointed to bitter strategic and energy rivalries between Washington and its nominal European allies. While Forbes unmistakably saw a potential Franco-Russian alliance as threatening US interests, Germany’s Die Zeit was, by contrast, agreeably surprised. It is ever clearer that the sudden, rapid and unpredictable shifts in the foreign policy of the various imperialist powers are not passing events or coincidences, but symptoms of a far broader crisis of the capitalist system struck by more than a decade of deep economic crisis. In 1991, the Stalinist dissolution of the Soviet Union deprived the NATO alliance of a common enemy. Over a quarter century later, the process of NATO’s internal collapse is in a very advanced state. The wars in Iraq and Yugoslavia launched by the United States and its European allies in the 1990s have escalated into wars across much of the Middle East and Africa, and vast US-led confrontations with Russia and China, with a major NATO military build-up in eastern Europe and the US-led “pivot to Asia” aimed at China. Every indication is that the shift Macron is undertaking has been under preparation for some time, amid mounting opposition in European capitals to the impact of US wars on their strategic interests. Macron himself traveled to Russia last year as economy minister and met with his Russian counterpart, Alexei Ulyukayev, to announce that despite EU sanctions on Russia, Macron hoped French economic ties to Moscow would deepen. 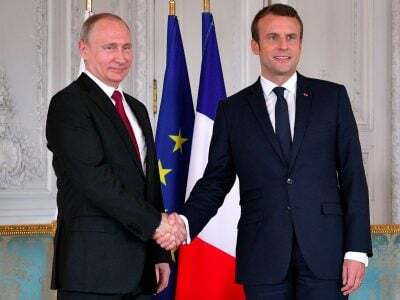 Under the impact of the sanctions, France’s trade volume with Russia has been halved, to only US$11.6 billion per year. Macron’s prime minister, Edouard Philippe, was the mayor of France’s busiest container shipping port, Le Havre, which repeatedly hosted the influential China-Europa business summit. The deepening strategic and economic rivalries between the NATO powers constitute a warning to the working class. After a quarter-century of escalating war, the remilitarisation of German foreign policy and Macron’s call for a return to the draft in France, the European ruling elites are preparing an explosion of imperialist militarism fought in the interests of the banks, shareholders, and major corporations. Workers cannot support any of these contending imperialist powers, on either side of the Atlantic; all are led by ruling classes bitterly hostile to working people and that are preparing horrific wars. What is emerging is not the bankruptcy of one or another imperialist power, but of world imperialism, and a plunge by international capitalism back to the type of conflicts that twice in the last century led to world war. The reactionary character of Franco-German imperialist interests is perhaps most strikingly indicated by the nature of Macron’s government. Having extended France’s nearly two-year-long state of emergency, which suspends basic democratic rights, it is preparing to impose deep cuts to jobs and social benefits in authoritarian fashion, by decree. As it prepares to wage war overseas, it is pouring resources to boost police force levels and increase the number of prison cells, in anticipation of a confrontation with the working class.